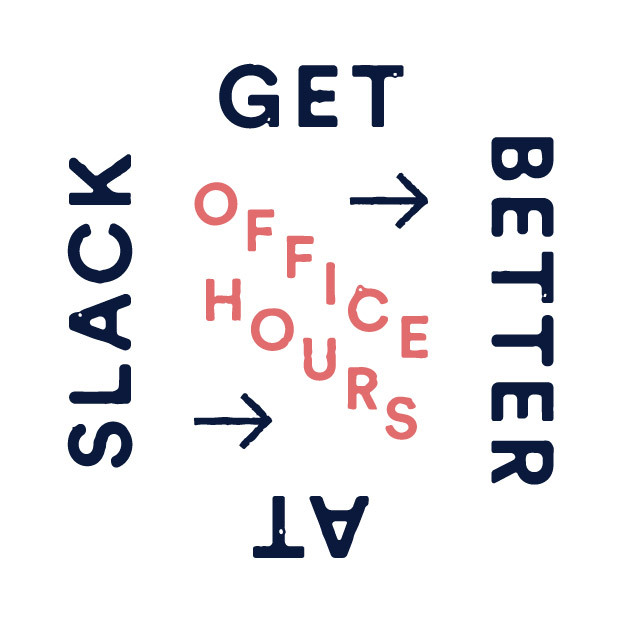 This post marks the debut of our new Office Hours series. Every couple of weeks we’ll post an article that helps people on all kinds of teams get better at using Slack. @SlackHQ trying to set up slack for my scientific lab. Everyone works on diff projects but sharessame equipment / meetings etc – tips/ideas? Brady asks how best a science lab can share resources and track team projects within Slack, but any answers I give to this researcher work equally well on almost any small team. Think about it — imagine a workplace with a staff of maybe a dozen or so, like a real estate office, an accounting firm, or a small town newspaper. They are all groups of people working on different projects but toward common goals, and they’re all sharing scarce resources, be it centrifuge or conference rooms. Before computers, I spent years working in chemistry labs, so naturally I jumped on the chance to answer Brady’s question. It occurred to me my reply could be useful for almost any small group adopting Slack. First, the basics. Once you are familiar with how Slack works and you have buy-in from the team to try it out, call a meeting to get everyone else on board. Invite all attendees to a Slack team, make sure they have the desktop and mobile apps installed, and are successfully logged in. Review the basics of how channels and direct messages work, and consult these handy guides as needed. Each team will have people with different roles, and that affects how they interact with Slack. There will be someone in charge of the team who makes a lot of team-wide announcements, there will be people managing people and resources, including administration of Slack, and there will be people working and sharing their results on various projects. Even on a small team, not everyone needs to be, or in fact should be, in every one of your team’s channels. The different roles can help you figure out what channels to create, and who should be a part of them. A professor or lead investigator who acts in an advisory role. They’ll be making announcements, overseeing the entire team, and will be in a mix of public and private communication while using Slack asynchronously. Lab staff who maintain equipment, order supplies, and keep everything running, likely including administration of Slack. Researchers will probably outnumber everyone else, doing the work of capturing and analyzing reams of data in the lab. How you go about naming and organizing channels is one of the most important aspects of keeping a team on task and productive. For small teams, it’s good to set up channels for each project, use integrations to alert people about shared resources, direct frequent discussions into topic-based channels, and set aside a few channels just for fun. Rename #general to #announcements. Have the professor/advisor post updates there instead of sending email to all. Optionally, lock it down to only allow posts from Slack admins, directing discussion elsewhere. This makes for an easier-to-skim channel of just the most important things. Create a channel for every project, with a common naming prefix so they’re easy to find in the channels list. Have researchers upload their data, results, photos, figures, and graphs into their respective project channels. Discuss data and findings in the project channel as well. This way, if you need a spreadsheet containing data from six months ago, you know exactly where to look. When new researchers join the team, add them to relevant project channels and they can scroll up and see the entire project’s history. A #meetings channel is a good place to drop notes from meetings as Posts and discuss any outstanding topics from previous sessions. Create a Google Calendar for important all-hands meetings and connect it to the #announcements channel with 15 minute reminders before events to alert everyone. Repeat the process for additional organization/department calendars. Create a shared Google Calendar for equipment, and ask everyone in the lab to block out when they need something with event titles that match the equipment name. Create a #lab channel, monitored by lab staff, for shared resources in the lab. Connect Google Calendar to it, with 9am daily posts of the schedule. Pin a message linking to the calendar so others can easily find it and add new event entries. Also use the #lab channel to request items from lab staff necessary to keep work going. Making it public to the team means others will know when someone’s already made a request for that badly needed new tank of argon gas. Fun stuff: Use #random for miscellaneous banter. Other channels like #sports, #movies, and #music may be created for talking about things outside of work. Search Slack’s App Directory to see if integrations already exist for your group’s favorite apps, then connect apps to your Slack team. If everyone in a lab writes drafts in Google Docs, connect Google Drive to Slack. Whenever links to Google docs get dropped into Slack, the contents are automatically indexed for searching. Same goes for Google Sheets, Google Slides, and any PDFs containing data. Share project files in Dropbox or Box and the contents of those files will also be searchable in Slack. For experiments that include writing code, connect Github to Slack so anyone working on a project can see when changes are made to their software. If projects are tracked with Asana or Trello, those apps can report into Slack whenever new items or changes are made. Slack’s /remind function is a great way to post personal or channel alerts at specific times. Small teams can use this to remind the main channel of weekly meetings or a daily standup to share short-term goals. For a lab’s use, you can do things like set a timer in a project channel when you need to remove samples from a test, letting others see when you’re done using shared equipment. You can also use personal reminders to remind yourself to do things in the future like /remind me to autoclave my sample bottles at 11am tomorrow. Now that your small group is equipped with a well-organized Slack team, you’ll be able to reduce email and share information in channels across your organization. The entire group will see when shared resources are being used and can request new supplies when needed. Team members can discuss data and findings in project channels, while advisors can skim through projects to see what everyone is up to at any given time, without needing to call a meeting. Feel free to tweak any of this advice to meet your own needs, but we hope there are enough ideas to get any kind of small team up and running (and organized!) on Slack.